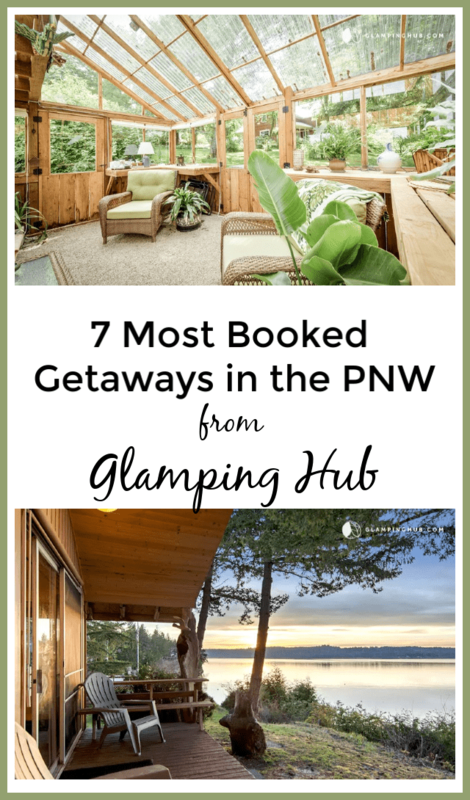 Glamping Hub has published their Most Booked Getaways in 2018, and seven Northwest spots made their list! We share the top 7 booked getaways in Washington & Oregon for 2018 from their list below. We previously shared our personal experience booking our trip to Seaside, Oregon in 2018 through Glamping Hub here. 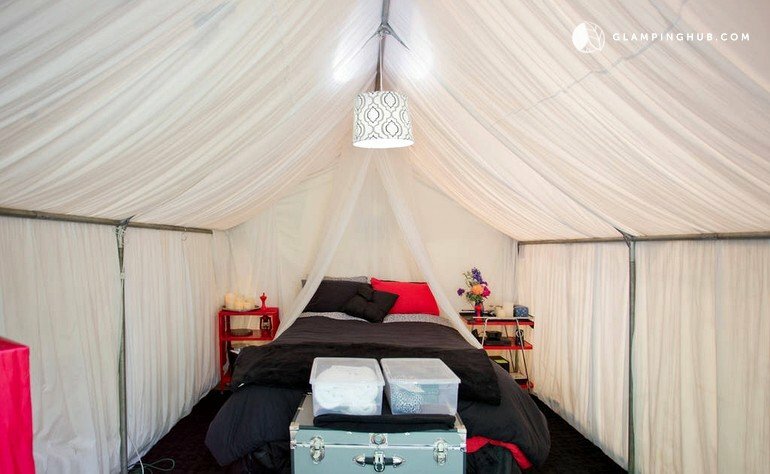 I often check Glamping Hub when looking at local getaways, as they have some really great unique options. We share the details of how the booking and confirmation process works in this post, but we had a great experience on our getaway. It is important to note that many of these rentals will have a cleaning fee (generally around the $100 range), so you will want to factor that into your daily rate. You can still get some great deals, but it is important to consider that in your planning process, as you look at the prices (the longer you want to stay, the better the deal is for you generally). When we were looking at booking options, there were a couple that really stood out, and we almost booked them ourselves. 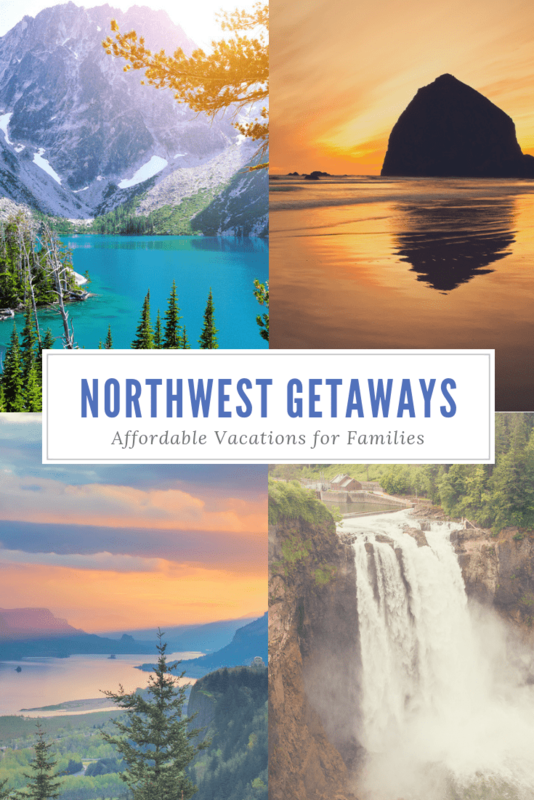 So, when we saw them pop up on the Most Booked of 2018 list, we knew that they were of interest to more people then just us, and wanted to share them with you, in case you are looking for fun, and unique spots in the Northwest for a great getaway. All of the accommodations below have a 4.5 star review or higher, at the time of us sharing (and by a decent number of reviewers). 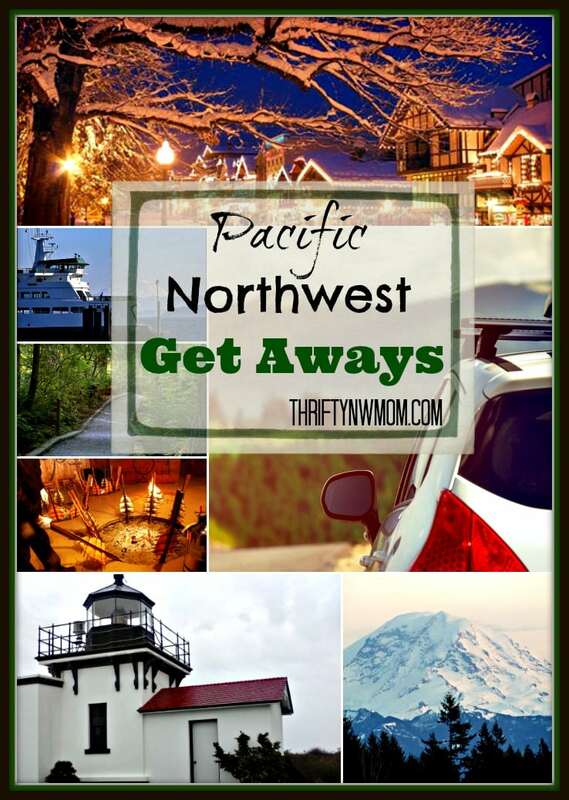 These are locations you are not going to find on your standard travel sites, and they really are some gems here in the Northwest. This is a spot I eyed and really wanted to try out, but we were traveling with kids and it only accommodates 2 people. It looks like it could be great as a couples getaway and the town of Silverton has a great quaint downtown area, a beautiful botanical garden, and hiking and waterfalls too! It makes a wonderful weekend getaway. 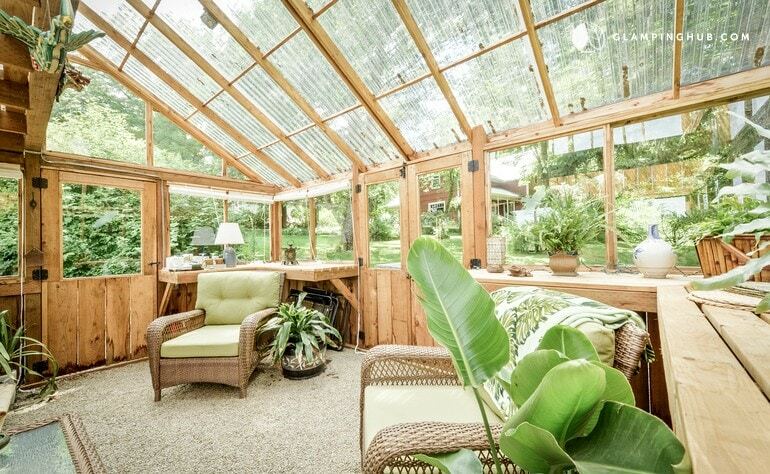 It gets a 5 star review, and includes your own personal hot tub in the green house you are staying in. 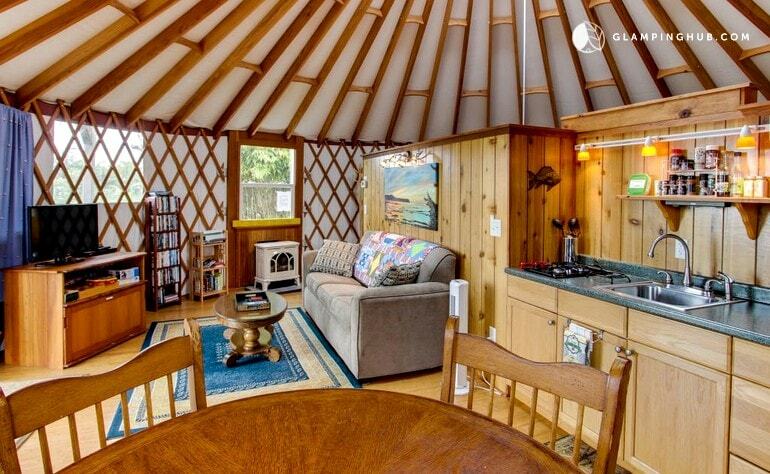 This yurt is one you can rent in Tillamook Oregon. If you like the idea of glamping (feel like your camping with a few more amenities, and less work), then this is a great option. 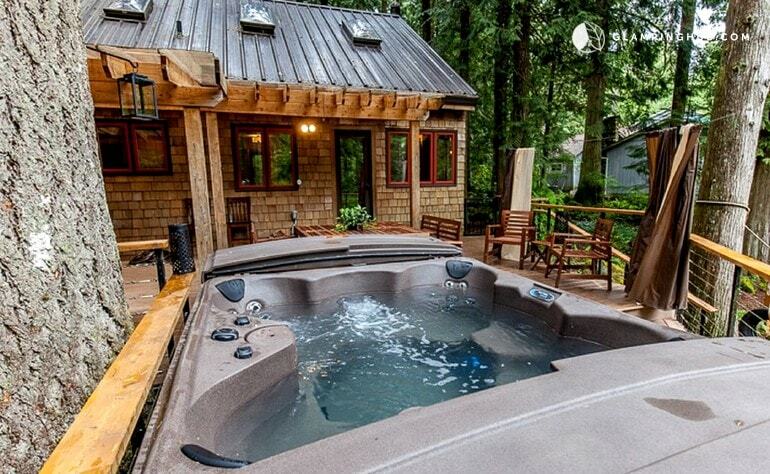 It even includes a hot tub just for your use when you rent it! This could be a fun rustic stay, to use as a base camp to visit places like the Tillamook Cheese Factory Visitors Center and the beautiful Oregon coast beaches. We stayed in Tillamook last summer, and it was a great base to visit some of our favorite spots like the quaint Oceanside area. There is a tunnel through one of the large rocks, that you can take the family through (it is a tradition for us when we are in the area). Lincoln City is about an hour south if you want a fun day trip. Another local attraction is the Tillamook Forest Center (pack a picnic, and spend some time exploring this outdoor adventure)! 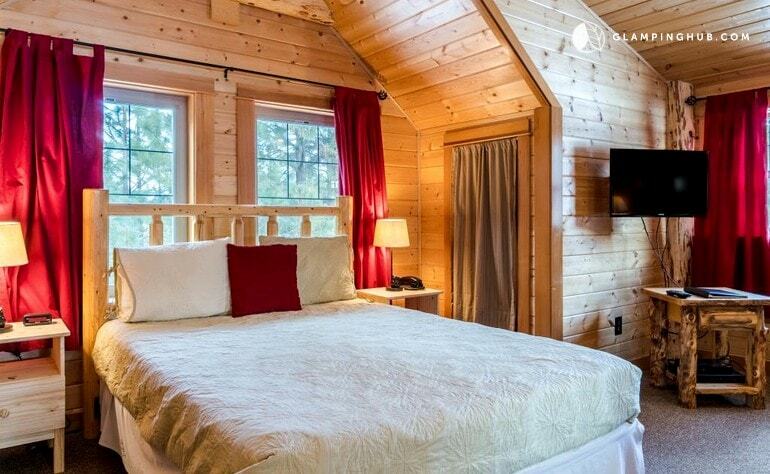 This cabin will feel like you are staying in a tree house, in the wonderful Mt Adams area. 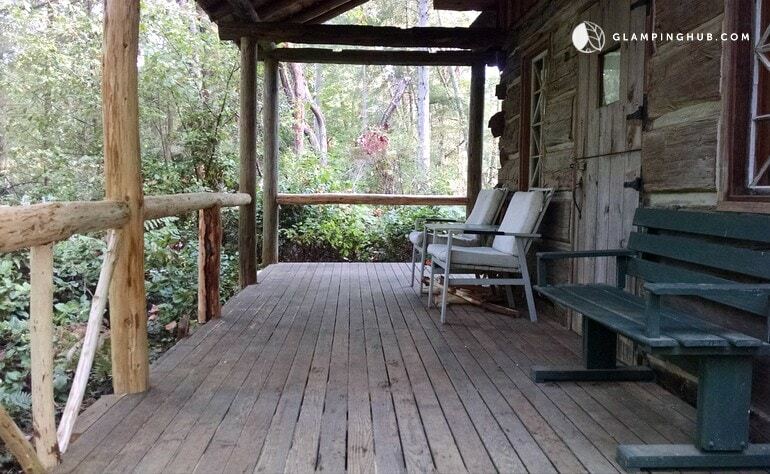 Its rustic charm, set in the trees make it cozy, and the hot tub is a perfect way to relax after a day of hiking. If you are going in the Winter, Oldman Pass is a fun area to do some snow tubing and snowshoeing and cross-country skiing are popular in this area as well. Mount Adams has a variety of outdoor activities any time of year – we visited in the spring & loved that it was a quieter, more peaceful area for exploring & we found a variety of hikes around Mt Adams, as well as these interesting Ice Caves hiking area. We also spotted quite a few deer & other wildlife. This is another one I had my eye on. It looks like it would be such a peaceful stay, relaxing at a beach front cabin on a private island! There are no stores or restaurants on this private island, so this is a getaway from those who really want to get away from the hustle and bustle of the city. They do provide two kayaks, two stand up paddle boards, a rowboat, and crab pots for guests to use (a big perk, in my opinion, since resorts will often charge around $40+ an hour to rent a paddle board). 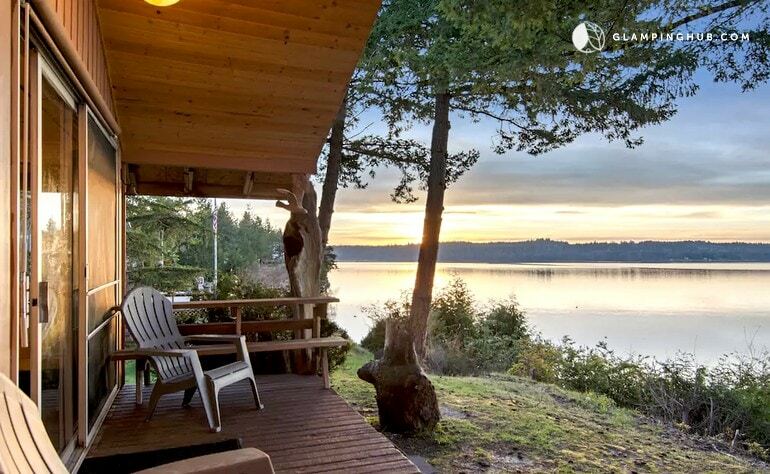 Here is another option on the private island near Olympia, if you have a larger family you want to house. This place looks bright and open, with beautiful views of the water. We love the Mount Hood area, in both the Summer and Winter. This cabin would be a great way to enjoy the beauty of the National Forest area, but also keep you close to plenty of things to do. There is so much to do in the Mount Hood area all year long. We love Ski Bowl (take a chair lift up the mountain, and slide down in a sled), or enjoy many more adventure themed attractions in the area. There is hiking, fishing, outdoor adventures and more (check out our Family Friendly Adventures in Mount Hood here, for lots of ideas). Looking for an island getaway that is peaceful, but also offers things to do. 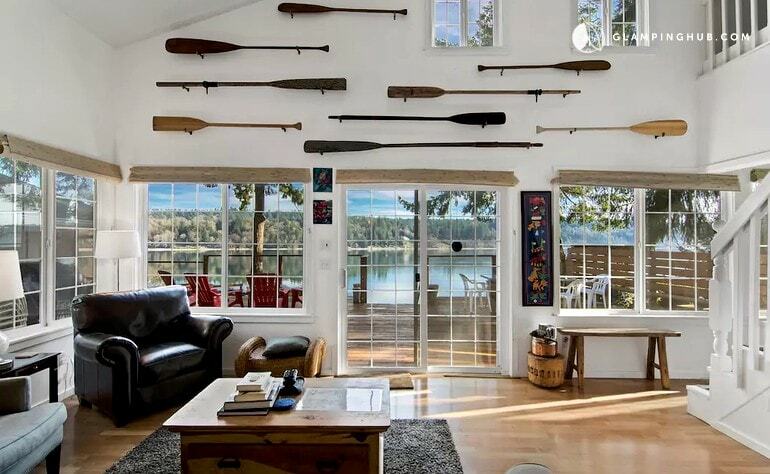 Consider this Vintage cabin on Vashon Island, that made last year’s most booked list too. This one is one of the more affordable options, but is one that only sleeps 2, and is geared at adults. It is set on 10 acres, so there will be plenty of outdoor beauty to enjoy. Find ideas to explore on Vashon Island here. We spent the day there last spring & loved the town of Vashon with unique restaurants & shops, as well as gorgeous parks around the island to view the sunset. Here are some bonus picks from us. These ones are not on the list, but for the price, we thought they might be accommodations some of you would be interested in checking out! This tiny house is located in Clinton Wa, on the south side of Whidbey Island. Rates start at as low as $99/nt, and sleeps 4 ppl. 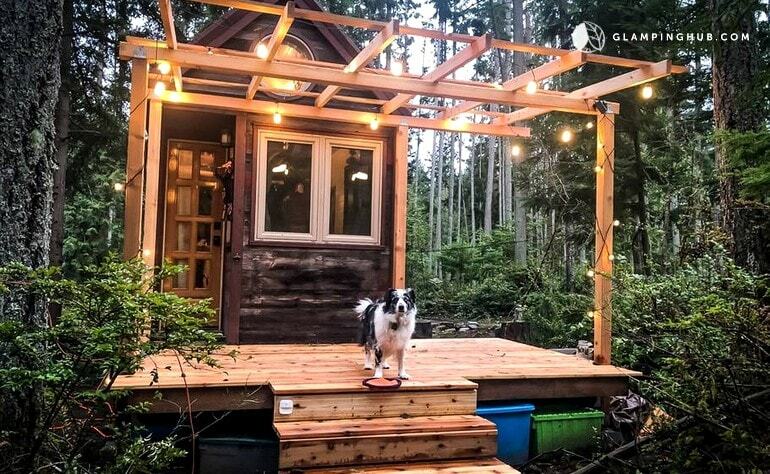 It was featured on featured on HGTV’s “Tiny House Big Living”, and is heated with a wood stove, to keep in line with the rustic feel of the wood cabin. Enjoy the peace and beauty of the outdoors, as well and venture into the quaint town of Langley for some shopping and dining near by. There are plenty of beaches to explore or just relax around your private fire pit at your tiny house rental. 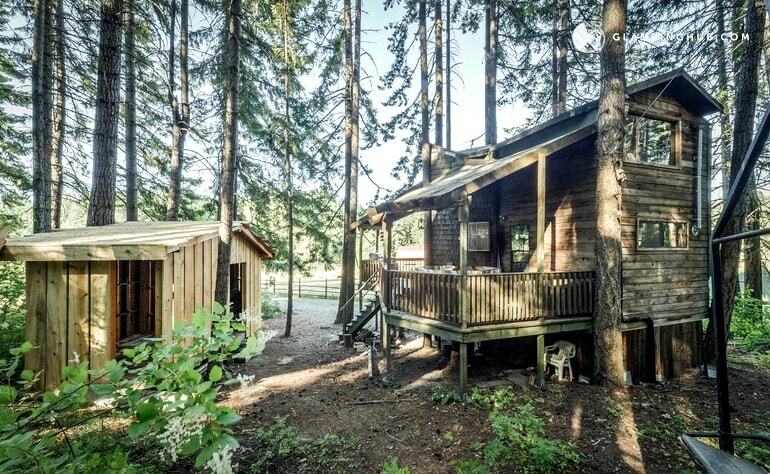 This cabin gets a full 5 stars, and is located in the popular area of Leavenworth. It has its own hot tub, and access to a private beach on the Wenatchee river. It is very affordable for the area, and I know my kids would love the loft sleeping area (it is a twin, so I am sure there would be some arguing over who got to sleep there)! I expect we may see this one on next years most booked list, so check it out before the prices go up due to popularity! from $112.35 a night (including all applicable fees – no extra cleaning fee added). Here is a super deal if you have wanted to try out glamping, but do not want to pay some of those higher prices for the resort canvas glamping tents. 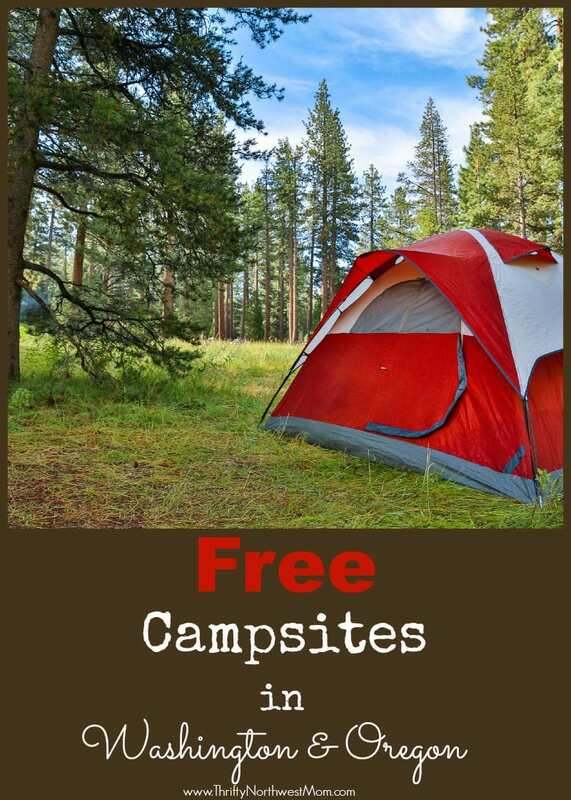 This will give you the experience of camping, but with some extra comfort and less work. It is located in the Sherwood area, outside of Portland. Enjoy the charm of Old Town Sherwood, use it as a base to explore Portland, or make it a romantic trip and explore Oregon’s wine country. 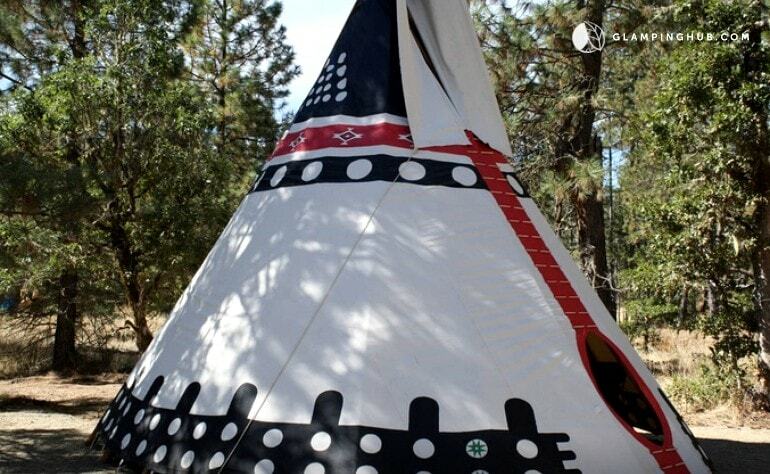 These Tee Pees in Oregon are about as affordable as you are going to find, for a family vacation, outside of pitching your own tent. You can reserve one of these for around $43 a night! You will need to bring your own sleeping bags for this stay, but there are futons set up in the tee pees for your comfort. The floor is covered in pavers, but there is no electricity (although you can opt to have propane heat added for $20/nt). This one may be best enjoyed during the summer months, but what a fun getaway with kids on a budget. The tee pees are part of a larger RV/Camping resort, so you will have access to grils, entertainment like a game of horseshoes, ladder ball, or Boccie Ball, laundry and bathroom facilities and more. This is great! I’d love to see a list of both pet friendly and kid friendly places fo stay in the PNW. We have 2 boxer pups and they are family. Those are great ideas! We will start looking into that and see what we can come up with. Thanks so much for the suggestion!